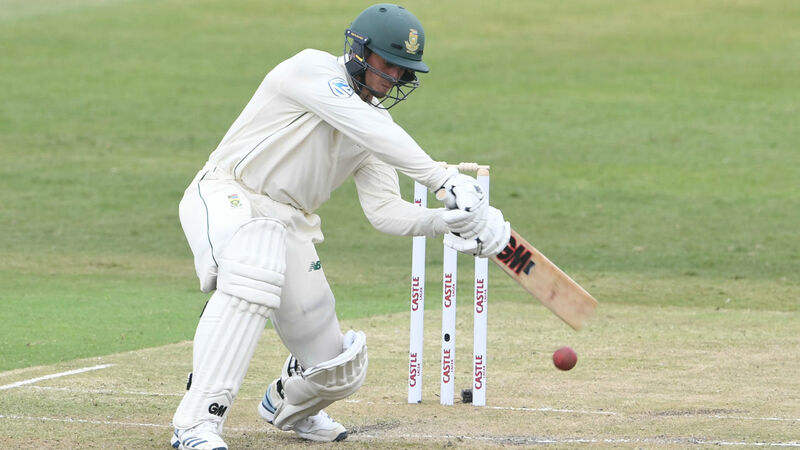 Quinton de Kock cited the importance of a fast start on day two as South Africa seek to gain a foothold in the first Test against Sri Lanka. The hosts were dismissed for 235 in Durban on Wednesday, with De Kock's knock of 80 providing some respite in an otherwise disappointing day for the Proteas. Sri Lanka lost a wicket early in their reply, closing on 49-1 as bad light stopped play, and De Kock knows his side must make a statement of intent when play resumes on Thursday. "We need to get off to a good start and try and find a way to strike early," he said. "They have shown some good intent within their batsmen and will look to score quickly. "We will have to figure out how we go about getting wickets." De Kock smashes the ball away for 6 & is caught out off a top edge from the following delivery from Rajitha (3/68). He's gone for 80 off 94 balls. South Africa are 235 all out (59.4 ovs). Vishwa Fernando was particularly impressive with the ball for the tourists, taking 4-62, while Kasun Rajitha (3-68) provided excellent support. But De Kock was not at all surprised by the quality of Sri Lanka's attack in the first meeting of a two-Test series. "Sri Lanka have always had a good pace attack, they have skill and their lines and lengths were tight as always," he added. "Here, a bit more movement off the wicket really assists them."